Railpictures.ca - Matt Watson Photo: Having interchanged grain loads with CN near Crooked River, Thunder Rail 2004 heads back home to Arborfield SK. I remember this chase lead me down some less than ideal roads. | Railpictures.ca – Canadian Railway Photography – photographie ferroviaire Canadienne. 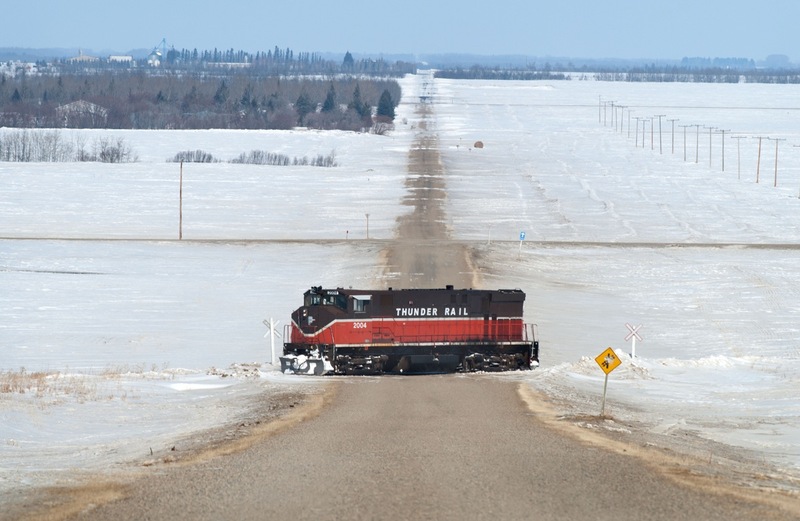 Caption: Having interchanged grain loads with CN near Crooked River, Thunder Rail 2004 heads back home to Arborfield SK. I remember this chase lead me down some less than ideal roads. Spent some time around here (actually bought a house in Zenon Park for the summer for $250!) and also Nipawin. Never saw anything move on the rails. I really wish I’d caught something on the bridge in Nipawin. Looks white and cold as far as the eye can see, but the M420R makes it all the more worthwhile!